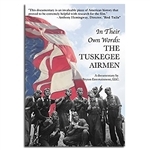 In their Own Words: The Tuskegee Airmen tells the story of America’s first squadron of African-American pilots who fought to protect the skies during World War Two. Ignoring the prevailing ideas of the time, the Airmen accepted the challenge, proved their mettle and set a precedent that led to the integration of the Armed Forces. Complete with emotional interviews, rare photographs and computer-generated recreations, In Their Own Words chronicles the Airmen’s story from the rocky start in 1941, to the acceptance of the Congressional Gold Medal in 2007. Almost twenty of the original Airmen came together to tell their story in a way never before seen: in their own words. The story is told by different Airmen, each contributing an integral part without reliance on narration. In its ninety minutes. “In their Own Words: The Tuskegee Airmen” whisks the viewer though laughter and tears; all while telling a historical story of hope and perseverance in the face of adversity.